Description: Rear view of AMTK 526. 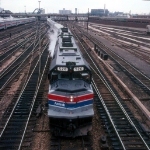 Description: AMTK 526 at LAUPT with City Hall in the background. Description: Guthrie OK -- This undated photo shows Amtrak's Lone Star traversing the bridge over the Cimarron River. Description: AMTK 526 heads Train #36, the "Desert Wind", eastbound up Cajon Pass. Description: AMTK 526 heads west with the "Desert Wind", Train #35. Description: AMTK 526 with the "Desert Wind" makes a station stop in San Bernardino. Description: A westbound coal train moves past AMTK 526 and the westbound "Desert Wind". Description: AMTK 526 will be one of the few SDP40Fs to escape being sent back to EMD. AMTK 526 will become ATSF 5255 and live on in yellow and blue.